Reading Time: 2 minutes The Dell(EMC) World event has been renamed last year in the Dell Technologies World Conference and has become a very very huge event and this year will be probably bigger than ever. Dell Technologies is the “umbrella” that includes all those companies: Dell, the new DellEMC, Pivotal, RSA, SecureWorks, VirtuStream, VMware. Reading Time: 3 minutes Six month ago there were only few VMware vSphere 6.7 books, but fortunately now there is a better offer with also some good and valuable resources. 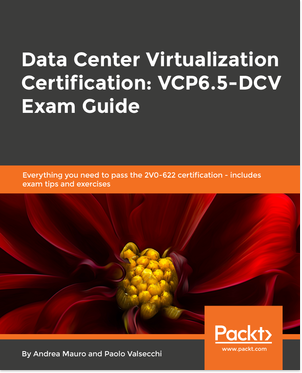 I’ve already wrote about the new edition of Mastering VMware vSphere 6.7, now I would like to write some comments about the VMware vSphere 6.7 Data Center Design Cookbook – Third Edition book released on March 2019 and written by Mike Brown and Hersey Cartwright. Reading Time: 1 minute As usual during the holiday season, Packt is launcing an interesting deal for all ebooks and videos: all can be purchased for only $10 each on packtpub.com website. This specil bid will run from April 18th 2019 until April 30th 2019, and every eBook and video is available for just $10 each. Reading Time: 6 minutes The new VMware vSphere 6.7 Update 2 has been announced some weeks ago, but was not yet available (although lot of people have already wrote about most of its features)… now finally VMware vSphere 6.7 Update 2 is general available (GA) and you can download the bits and really test all its features This is a huge step and called just an update release is too limiting… there are so much difference with the VMware vSphere 6.7 Update 1 (released on October 2018) to make it much more like as a 6.8 version. Reading Time: 3 minutes VeeamON is the big event from Veeam (actually only in the US) focused of course on Veeam products, but that has become an importan event that cover the data protection, the availability, and cloud data management aspects. It will be the fifth big global Veeam’s conference, excluding the local and virtual events… After the first edition in 2014, the second in 2015, the third in 2017 and the fourh in 2018. Reading Time: 3 minutes The VMware vExpert is an award is given to individuals who have significantly contributed to the community of VMware users over the past year. Basically the VMware vExpert program is VMware’s global evangelism and advocacy program. The program is designed to put VMware’s marketing resources towards your advocacy efforts. The awards are for individuals, not companies, and last for one year. Employees of both customers and partners can receive the awards. Reading Time: 2 minutes Kubernetes 1.14 is the first release of 2019 year with a production-level support for Windows Nodes. Kubernetes 1.14 consists of 31 enhancements: 10 moving to stable, 12 in beta, and 7 net new. The main themes of this release are extensibility and supporting more workloads on Kubernetes with three major features moving to general availability, and an important security feature moving to beta. Reading Time: 2 minutes CloudCredibility.com has selected 8 Pro players to make the leap into the inaugural first CloudCred Pro League. Typically, on CloudCred, players complete learning or engagement tasks on their own or with their team, earn points, and move up the leaderboards. No one but the player can observe what strategies he or she has used, and no one is able to watch this process. 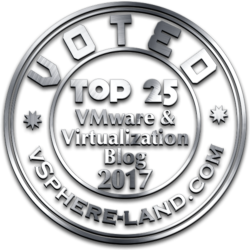 Reading Time: 2 minutes Also this year the results of the annual contest Voting for the top VMware & virtualization blogs are out on vSphere-land web site, after the usual live show where the top 25 were announced. This content has become a big reference for all virtualization blogger (it’s not necessary a classification on who is best compared to another), but the top 5-10 are honestly the real top blogger. And it has become a ritual event in this period of each year (there is also a nice History of the Top vBlog). 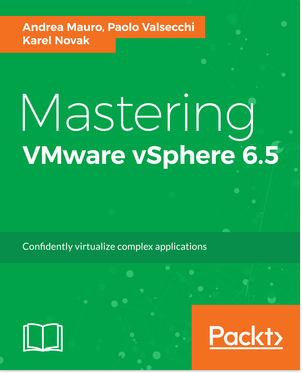 Reading Time: 2 minutes Packt has released a new book for VMware vSphere: Mastering VMware vSphere 6.7 – Second Edition written by Martin Gavanda. I’m in the author list, but just because some of the material of this book cames from the Mastering VMware vSphere 6.5 book. Reading Time: 3 minutes This year the vExpert 2019 announce has taken much time compared with the vExpert 2018 announce, because of some changes in the votation process. But finally has arrived, with some changes from the past years (not only for the delay, but also with the list that has been reduced). And also this time I’ve been confirmed as a vExpert. Note that “vExpert” is not a technical certification or even a general measure of VMware expertise, it’s much like an award.